The honey bees at Rosedale did not survive the winter and spring. Recently, Tom Smedley, Carey, and Ardis set up two new bee hives in the Southwest corner to replace them. As you probably know, we are losing honey bees worldwide at an alarming rate because of many things such as insecticides, disease, air pollution, habitat destruction, stress and more (bee colony collapse). 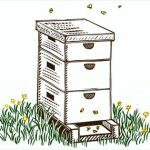 A couple suggestions for the Rosedale honey bees, please avoid activity around the hives and loud noises which are stressful for the bees. When stressed, bees may swarm and move to a less stressful home. When walking near the bees, try to avoid their flight pattern, which is a straight line when leaving the hive. Staying further away, you will avoid interrupting their flight and less likely to be stung. We are also trying to communicate with the Denver schools regarding their spraying schedule as we feel that weed spraying this spring may be the cause of the demise of one of the hives. Here’s a shout-out to Dave Shreve who spent an entire afternoon cleaning the empty hives and purchasing new wax foundation so that the new bees could be placed in clean hives when they arrive. This was very much appreciated. Rosedale Bees play an important role for all Rosedale gardeners.